1. On the stove top, melt butter and peanut butter together. Stir until smooth and remove from heat. 2. Add in vanilla extract, graham cracker crumbs and powdered sugar and stir until well combined. 3. Spread into a 9 X 9 or 9 X13 pan (I lined mine with parchment to help lift it out easily. 4. Chocolate Layer: Place chocolate chips and peanut butter in a microwave safe bowl and heat in the microwave for 45 seconds. Remove and stir. Continue to heat in microwave in 20 second intervals until smooth. 5. Pour chocolate over peanut butter layer and shake pan to distribute evenly. 6. 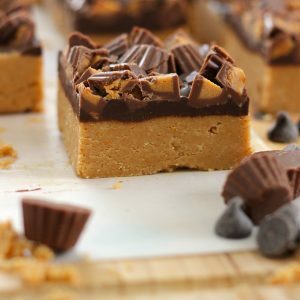 Wait for 5 or so minutes and then sprinkle your peanut butter cup (or other candy) on top of the chocolate. 7. Place in refrigerator for 20 minutes to let set.